The latest figures on firearm registrations paint a bleak picture for the Canadian gun community. We bought the smallest number of “restricted” firearms in three years last quarter, driven by declines in Manitoba, British Columbia and Quebec and a massive slowdown in Alberta. Gun owners across the country registered 4,318 restricted firearms from October to December 2014, the least since the fourth quarter of 2011, according to calculations by TheGunBlog.ca based on data from the RCMP. 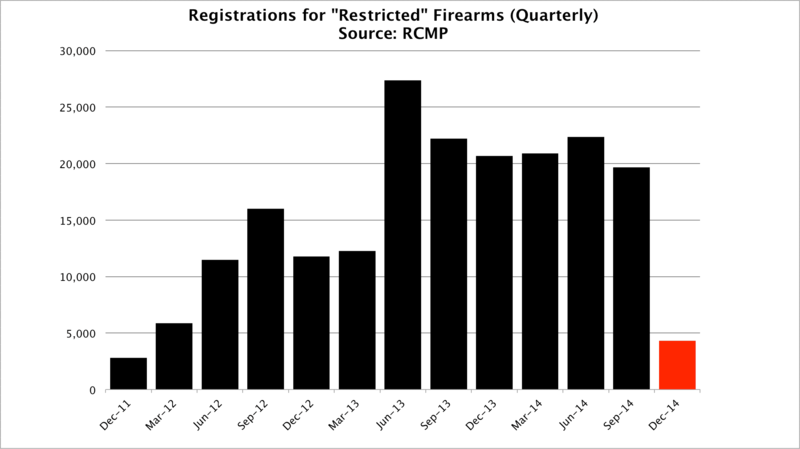 Registrations in Manitoba fell by 1.5 percent, or 442 firearms, in the October-December quarter, the steepest decline of any province. In British Columbia they dropped by 404, the first retreat since the RCMP data series began six years ago, and in Quebec they sank by 348, the first slippage since 2010. It’s sad for individual gun owners when they go to bed with fewer firearms than when they woke up. It’s sad for the community as a whole when our numbers weaken. Especially in Canada, especially in an election year, it would help us to show strength as we fight to replace our unjust, ill-conceived, confusing and costly firearms regulations. Canadian law classifies pistols, revolvers and popular rifles such as the AR-15 as “restricted,” and requires buyers to register their purchases with the RCMP. Non-restricted firearms don't require registration. Even in provinces where registrations went up last quarter, the trend points to decline. Albertans registered 1,105 restricted guns in the period, 0.7 percent more than in the previous quarter, representing the slowest pace of increase since the data became available. Ontario was the biggest provincial contributor to restricted-firearm registrations, with 3,691. That’s a 1.5 percent gain from the previous quarter, but the slowest advance since 2012. Here's to a better 2015.